This could be interesting. And no, you can’t put yourself down. I’m unsure on mine. 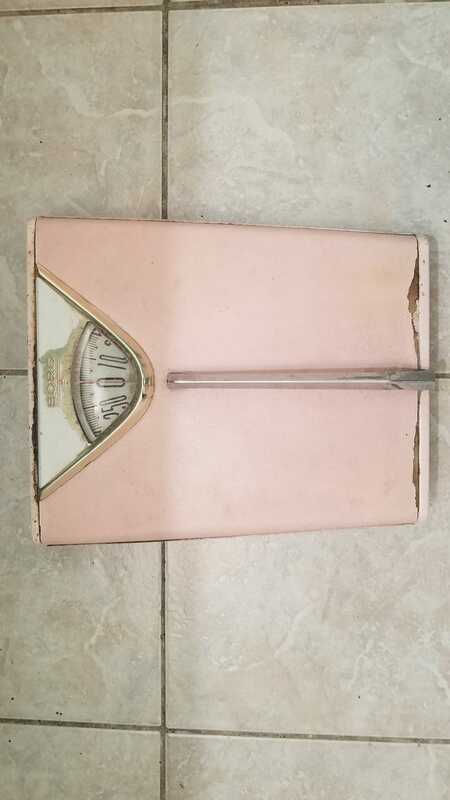 The pink Borg bathroom scale above was made in the 50's so it’s definitely a contender. Sure, it’s a bit worn, but it works just fine for my purposes. Doesn’t need to be accurate, as I’m uninterested in weight. I just need a way to track the CHANGE in weight. So, old pink scale. Maybe someday I’ll clean it up, but probably not. Contender number two! Copper and bakelite rotary dial phone. No clue where this came from, I’ve had it for years. I seem to recall that it was Dutch... So... 40's maybe? Damn thing weighs almost twenty pounds. They don’t build ‘em like they used to!